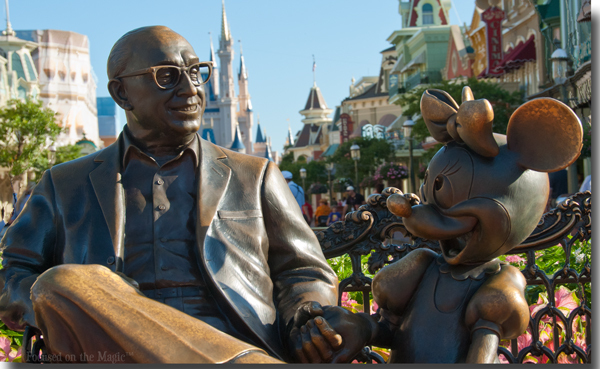 This statue of Roy O. Disney seated on a park bench with Minnie Mouse is located in the Town Square section of Main Street, U.S.A., at the Magic Kingdom in Walt Disney World. Roy Oliver Disney, Walt Disney's brother postponed his retirement to oversee construction of his brothers dream, Walt Disney World. On October 25th, 1971, Roy dedicated Walt Disney World in a nationally televised ceremony. Roy died two months after the dedication on December 20, 1971.
a Magic Kingdom where the young at heart of all ages can laugh and play and learn together. Dedicated this 25th day of October, 1971. Disney-related posts are always welcome to link up!! Upcoming themes will be posted on Facebook, Twitter and on the blog by Sunday night. I would like to wish you all a very Happy Thanksgiving! I am so thankful to all of you for stopping by each week, linking up your posts and taking the time to visit with me. I always look forward to Wednesday's with you! Eat, Drink & Be Merry & Have a Happy Healthy Thanksgiving! Thanks Melissa! I hope yours is fabulous Thanksgiving too!! Thanks for stopping by for Wordless Wednesday! 18 more days, WooHoo!! Great post Deb! I love the pictures, the words, and I'm really digging the layout! Beautiful photos, as always!! Happy Thanksgiving! Thank you Jenn, you're very sweet:-) Happy Thanksgiving!! Happy Thanksgiving! I can't wait until February for my trip! You're welcome Tami! I love this statue. They move it around the holidays, so maybe it wasn't in the hub when you were there. Happy Thanksgiving! Hope you have a magical trip! I think these two are the best statue photos I've seen! I don't have any at all. That's so wrong, isn't it? I must go back for statue photos...hopefully a lot like these. Love them, Deb. Wow Thanks!! I think we need a field trip to get more pics;) The sooner the better!! Roy Disney is on my list of people I wish I had met. Thanks Manda! Hope you're connected once again!! Love these pics and the wonderful sentiment. Thanks so much for giving us all a place to share our Disney passion. :) Happy Thanksgiving! Thanks Alyssa Ray! 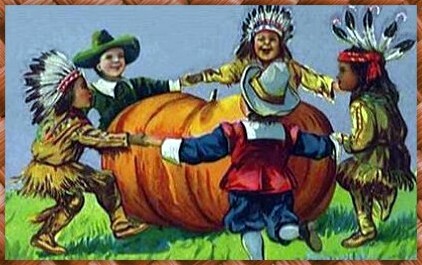 I hope you have a very Happy Thanksgiving Day! !